On June 30, 1969, the Purdue University Creamery closed. After the doors were locked and production of quality dairy products on the Purdue campus ceased, only memories lived on, and many of those memories are the basis for this book. 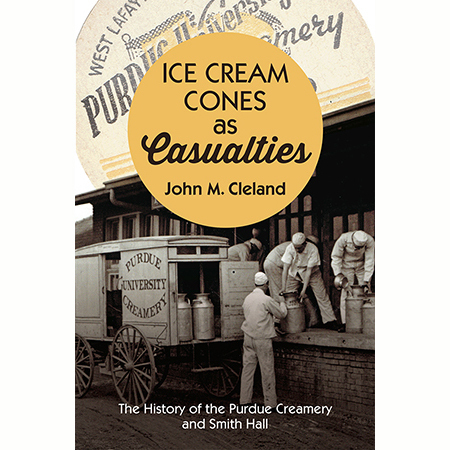 Ice Cream Cones as Casualties is a documented historical review of people, buildings, events, and products that made the Purdue Dairy Department one of the country’s leading research, extension, and educational institutions for dairy manufacturing. Also included are personal stories of nostalgia as told by former students, faculty, and people of the West Lafayette community. Some of the world’s greatest cheese and ice cream were sold through the salesroom of Smith Hall, the building called “the best known building on the agricultural campus.” By reading this book, you find out about the differing views on the creamery’s closing and imagine, or perhaps even recall, the attraction of eating a delicious Purdue ice cream cone.